I could really use your support on this project. We are asking all of our friends to purchase multiple copies of my upcoming book “Living in the Village” to reach our goal of pre-selling 5000 copies by December 15th. Living in the Village is more than a book; it is a movement. It represents the work of not only me, but many people from all walks of life who have decided that their economic future is not written for them, but by them. 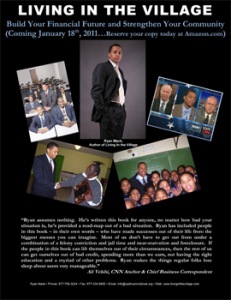 Throughout the book you will hear from gang members, real estate developers, formerly incarcerated, inner city youth, single parents, teachers, entrepreneurs earning seven figure salaries, corporate professionals, professional athletes, and many more from a variety of demographics that have all used principles of fiscal responsibility to overcome tremendous trials and are currently empowering communities around the world. In addition I have written about the principles they used so you can implement those same principles of fiscal responsibility and economic empowerment within your life as well! 2. Forward this email to your network of friends and family. 3. Give the extra books to friends you know when you receive them on January 18th. 4. Ask each recipient to purchase some books to give away. (Proceeds from the sale of this book will be used to support the efforts of our non-profit The Optimum Institute of Economic Empowerment). If you have any questions please feel free to email me or call me at 877-758-3224 ext. 2. Thank you for the support and let’s continue to build stronger communities.